The United Mankind's war against the Humankind Empire Abh has raged for three years and now the Empire has prepared a bold plan to reconnect their territories split by the initial enemy offensive: Operation Phantom Flame. Jinto and Lafiel, after being separated for during those years and having grown somewhat distant, find themselves serving together again on a small craft that is part of the Imperial fleet that is about to engage in one of the most costly and important battles of the war. A battle where the Imperial forces are outnumbered fifteen to one. Banner Of The Stars' plot concerns the logistical build-up, planning, and execution of a major battle revolving around a key strategic point from the point of view of several different levels of personnel involved in the operation. While at first that might sound like it would only involve just episode after episode of battles, the show's tight emphasis on character work keeps the central most important focus on the developing relationship between Lafiel and Jinto while also fleshing out the world of the Abh a bit more in detail by introducing new characters and developing some of the characters already introduced in Crest Of The Stars in more detail. While lacking the scope of a show like Legend Of The Galactic Heroes, Banner Of The Stars still does a superb job of depicting the different concerns and actions of people involved in a major galactic battle. Solid dialog and strong character interaction are one of the core strengths of Stars franchise, and this title generally is generally not disappointing in this area. Though the show is a bit Abh-centric (though that is like saying All Quiet On The Western Front is too German-centric), it develops the society in much greater detail such as by giving more insight into the relationship between the Abh/Lander world relationship and introducing non-Abh human characters who serve in the Imperial Navy. The expository segments are actually integrated and reinforced by events in the individual episodes a bit more effectively than in Crest Of The Stars giving them a sense of much more immediate relevance to the immediate plot rather than simply serving as historical background as they previously did. While the viewer doesn't quite get as much of a United Mankind view of the events or perspective as you see in parts of Crest Of The Stars and Banner Of The Stars II, this doesn't hurt the title much given the tight character focus on a few individuals. However, this does contribute to making this chapter of the story not quite as engaging overall. It was also interesting to be get to know several more rank-and-file Abh as opposed to the mainly high nobles that had been focused on in Crest. The title does a fairly good job, in a brief period, of introducing a number of characters whose fates' genuinely concerned me. In any story dealing with war, the cost of war needs to be addressed. While not doing quite a solid a job at that as Banner Of The Stars II, it isn't shied away from either. Lafiel and Jinto, having new responsbilities, have to deal with a number of new challenges all the while reacquainting themselves with one each other. The relationship between Lafiel and Jinto, however, was also one of the elements of Banner Of The Stars that I felt was handled more poorly than it could have been. A large amount of the character development time spent between the two in Banner comes off as a slight rehash of what we've already seen in Crest Of The Stars. In context of their separation, this does make sense logically but I felt just a bit too much time was spent in this title going over ground that had already been covered in the previous title. 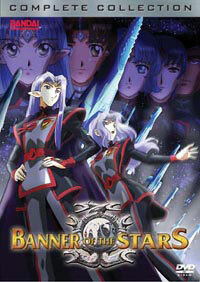 The interaction between the two and the other new characters helps offset that particular weakness but Jinto and Lafiel are the heart of the Stars stories and since their character development and personal plots weren't as strong, it helped make Banner Of The Stars the weakest of the currently available Stars anime . This entire storyline, after all, isn't about making some sort of grandiose point about the nature of war or the factions involved but instead exploring how the lives of two young people are being affected by being swept up in these galactic events. The artwork and animation in this title is a bit better than what was presented in Crest. There are a number of ship battles but many involve such a massive scale that there isn't as much gritty personal ship-to-ship action as one might expect. However, through the experiences of Lafiel and her ship's crew, the viewer is shown what a battle seems like from the perspective of the individual vessels involved in this massive altercation. If you have recently watched Crest it might seem somewhat frustrating to have so many flashbacks to scenes from the earlier anime. However, if you haven't watched it in quite some while, you will undoubtedly find the flashbacks scenes useful for helping place a lot of the characters and events in better context. Like the first series, this show can get quite dialog intensive at times. Even in the context of the galactic war, this is a show about character interaction first and foremost. Action junkies should consider themselves warned. The music, for the most part, is mostly the same as in Crest Of The Stars. I enjoyed the music in the first title, so I enjoyed it here but I do think it would have been more effective for them to have produced more unique and original tracks for the second series. They do enhance a few tracks here and there but viewers should not particularly expect any surprises from the soundtrack. Recommended Audience: Tens of thousands of people die in the course of the space battles in this show and on occasion the viewer is shown the interior of an exploding ship as the crew screams and is overcome by flames and debris. Overall, it is more appropriate for teens and above.